When he isn't kicking footballs or cursing out Maryland politicians for our friends at Deadspin, Chris Kluwe spends his time playing video games. Lots and lots of video games. Kluwe, who made national airwaves last week when he wrote a passionate letter in defense of gay marriage, is both an NFL punter for the Minnesota Vikings and a rabid RPG fan who thinks Lost Odyssey is severely underrated and Ogre Battle: March of the Black Queen is one of the best games ever made. But I didn't realize just how big an RPG nerd he was until I saw him write a comment on Deadspin about his difficulties taking down a boss in Final Fantasy IV. So I got Kluwe on the phone a couple of weeks ago—before he became the Internet's favorite punter—to ask him some important questions about his love for games. Questions like: "How many NFL players have you tried to get into JRPGs?" "I did get one of our defensive linemen," Kluwe told me, laughing. "I pushed him towards Dark Souls. He enjoyed playing that for a bit, although he was like 'man, this game's one of the hardest games ever.'" "That's it?" I asked. Surely there must be some other football players who like to dabble in the occasional Dragon Quest or Final Fantasy when they're not smashing their helmets into one another for millions of dollars. "Well, hey there's these magical things called Espers, and at first you're this person who's kind of like half of one, but then you're gonna find like thirteen other characters..."
"It's kind of tough to sell JRPGs to people who may not have played them before," Kluwe said. "Most of the time, when trying to describe the story of what's happening in a JRPG, you've kind of gotta accept that a lot of stuff isn't going to make sense. I think that the latest—Final Fantasy XIII-2 or whatever it was—was just like 'Hey, time travel!' and... yeah." Kluwe has theories about this inaccessibility. (And about why most NFL players stick with Madden and Call of Duty over Persona and Xenoblade). "Hopefully they keep making [JRPGs] cause they're a lot of fun to play. It's just— it's probably on us as gamers to make sure our children growing up playing those old classics. So they kind of realize, 'Hey, this is the backstory behind everything.'" Like many twenty- and thirty-something gamers today, Kluwe, who is 30, grew up during the eras of Nintendo and Super Nintendo. He cut his teeth on Final Fantasy—"I was instantly hooked despite those instant-kill wizards," he said—then spent his childhood playing games like Chrono Trigger and Final Fantasy VI. Unlike many twenty- and thirty-something gamers today, Kluwe became an NFL punter. Still, he's a friendly, down-to-earth guy with some friendly, down-to-earth opinions. He thinks the Super Nintendo age was the golden era of RPGs: "Square and Atlus and all the games they had on there—Ogre Battle, obviously Final Fantasy, Chrono Trigger—just all of them. That was probably the greatest era of RPG gaming that I've been lucky to be a part of." 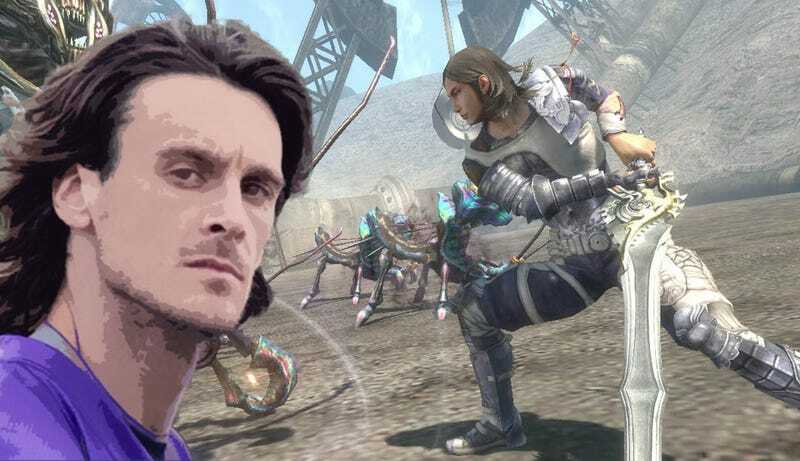 He thinks Lost Odyssey is under-appreciated: "The writing and the short stories and just the overall scope of the story, it was crafted really well. Especially the fact that they approached this whole thing where you're this immortal character and it's not just like 'Oh, hey, you're immortal, that's cool. There's legitimate consequences to being this being that lives forever." He has a passionate love for Ogre Battle on the Super Nintendo: "I don't know what it is, I can just play that game any time... the great thing was, there was just so much hidden stuff in the game that you had no idea was there unless you went and explored. You'd have to go to maps you already cleared, clear maps in a certain amount of time... it was fun just finding all that stuff. Especially since when you beat the game the first time it's like, 'Alright, I guess I beat the game, that wasn't that great. But then you go back and you actually find everything and you're like 'Wow, this was a really cool story.'" He even fell for a fake Easter egg back in the day, before the Internet ruined all video game secrets forever: "One of my friends in school tried to convince me that in Final Fantasy IV there was like this secret moon base that you could like find some secret way to get to. I tried forever to try to get to it but then I finally figured out he was lying to me." Kluwe is even a character in a video game. Sadly, that video game is Madden. Not a JRPG. But hey: baby steps.